I said I was on a blog break. But I was in the garden yesterday with my camera and couldn't help but share a few shots. Cosmic Purple Carrots (they're orange on the inside). My lone Red Detroit beet. The seed was old, however, so I didn't expect much. 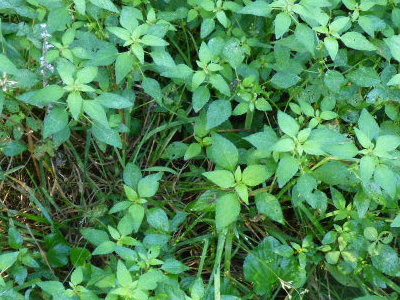 Volunteer chickweed. A favorite for salads and chickens. Multiplier onions, collards, and clover. Shin Kuroda carrots, clover, and multiplier onions. Puzzling radishes. I thought I planted Purple Plums. Chop it all up and put it in a bowl with feta and olives - salad! "Hey! There's no verse about a goat in that song!" "We need to write one of our own." Watched o'er His cradle all through the night." 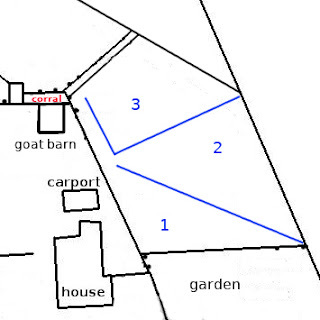 "I," said the goat with eyes so bright. Wishing you all the Happiest of Holy Days! Merry Christmas! I'm going to take a wee bit of a blogging break, so I'll see you next year! "Hmph. No verse about kitties either." I tend to not do a very good job at planning ahead for meals. I know some folks are really good at it and because of them, I know all about weekly menu planning. I know all about once-a-month cooking. I've thought these are good ideas but have never been able to work them into my reality. In fact, most of the time it's midafternoon before I figure out what to fix for dinner. Dan changed that this past summer. Every Sunday he grills hamburgers for dinner. He stopped using charcoal briquets a long time ago, favoring cooking with hardwood instead. He has experimented with smoking the burgers and has gotten quite good at it. He uses mostly pecan (in the hickory family), but we also have apple, pear, and peach trees which impart a lovely flavor. This is truly frugal cooking. Hamburgers cook pretty quickly, however, so he was always commenting on the lovely coal bed left glowing after the burgers were done. "Do you have anything else to throw on the grill?" he would ask. So I started buying or defrosting something else to throw on the grill. He worked his way up from burgers, drumsticks, and leg quarters to whole chickens, ducks, and roasts. With less tender cuts of meat he'll hot smoke them on Sunday and the next day I'll finish it up in the slow cooker to tenderize it. Then, if the cooking broth doesn't become gravy, I freeze it for homemade smoke flavoring to add to soups and stews. What's really nice is that this extra Sunday cooking gives us three or four days of a delicious, ready-to-eat main course. And that means nightly dinners are easier to plan and prepare. Win, win, win! Care to share your ideas for simpler cooking and menu planning? I can use all the tips I can get. Something I've been wanting to grow is heritage wheat. We've been growing our own wheat for several years now, but it's commercial seed purchased in a 50-pound bag from the feed store. By growing our own we avoid herbicide and pesticide contamination. Also, the glyphosate (round-up) that is used by commercial farmers to kill and dry the crop evenly for processing. Plus we can improve the nutrient content. But it's still modern wheat, which has been so "improved" over the past couple of decades that it's causing a lot of health problems for people. As with all things industrialized, these "improvements" designed to make the crop more profit-friendly not human-friendly. All excellent reasons to switch to a heritage type of wheat. Several years ago I bought a packet of Egyptian wheat seed. Egyptian wheat that I grew the summer of 2015. It grew well but I didn't realize it is actually a large-seeded sudan grass rather than a true cereal wheat. There's certainly a place for that as critter feed, but I was disappointed because I wanted a true wheat for making bread. This year I decided to try again. The problem was that I was unable to find bulk seed. 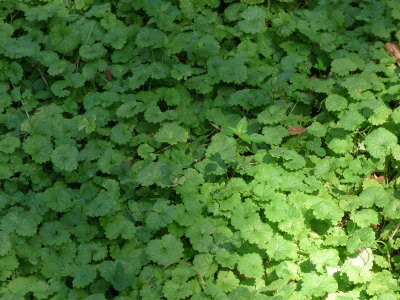 I could find small quantities of an ounce or 500 seeds or so, but not enough to plant a quarter-acre like we usually do. Even those small amounts are pricy. The Heritage Grain Conservancy website offers an excellent variety of heritage wheats, but they want $25 for an ounce of seed! That is counter-logical to me. If one wants to conserve something, doesn't it make sense to get it growing by as many people as possible? Fortunately, Baker Creek Heritage Seeds had several old wheat varieties on offer, so I decided to try Red Fife, a landrace wheat. 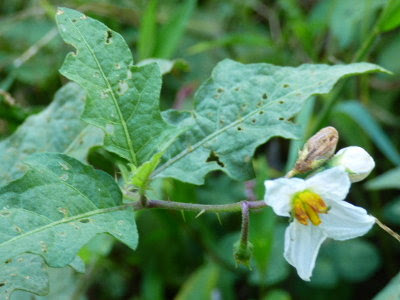 Landrace types are old heritage types with a diverse genetic base. That means that they are adaptable to a number of conditions. I figured I'd have the best chance with that. Red Fife can be planted in spring for a spring wheat crop, or in autumn for winter wheat. Winter wheat has always worked well for us because of our mild winters. It was only sold in ounce packets, so I figured I'd grow one bed as a seed crop. No special soil preparation is necessary, but I added a little compost to the soil because I chose to plant it where I had grown our summer's corn. Bed in which I planted wheat and clover. Doesn't exactly look like wheat is growing there, does it? That's because it isn't! If you look closely you can see some of my clover growing. But except for a blade or two of grass which may or may not be wheat, I'm chalking this experiment up as a fail. I'm going to give the bed a deep blanket of mulch and try heritage wheat in another spot next year. Thankfully our commercial wheat patches are growing well. Winter wheat mixed with clover. It looks like lawn at the moment. We plant about a quarter acre, from which we harvest enough wheat berries to last until the next year's harvest. Hopefully, as we improve our soil we'll improve our yield. My goal is to harvest enough for our year's supply plus enough to save seed for the next crop. 2018 will be over in just a little over two weeks! Can you believe it? It's time to take a look back over the year and see how well Dan and I accomplished the goals we set for the year. I blogged about all of these fairly recently so I won't go into detail. You can follow the links if you missed those blog posts. In a nutshell, here are our goals and how well we did. How about you? Were you able to accomplish much on your new year goals list? What we woke up to Sunday morning. After an inch of rain on Saturday, we got three inches of snow overnight. Plus, everything was coated with ice. I dread ice worse than snow. While our northerly neighbors get snowed in under feet of snow, we get iced in by as little as a quarter inch of ice. It coats absolutely everything and makes it near impossible to drive (or walk) anywhere. It's not uncommon for tree branches to be so heavily laden with ice that they break and fall onto power lines. That can mean days or weeks without electricity. These two pine trees didn't fall on power lines, but they fell on pasture fence! pines to mill into posts for his carport repair project. Here they are! Fortunately, we only lost power for two hours. I know some areas in the Southeast are still without, so I'm thankful we didn't have it worse. Still, it made me glad I recently bought something that has been on my winter preparedness to-get list for several years - an Ecofan. 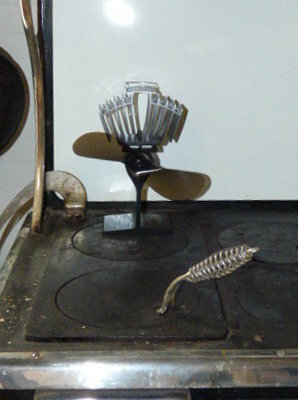 It sits on top of the woodstove and makes its own electricity from heat differences between the top and bottom of the fan (technical explanation here). It's a brilliant off-grid way to help circulate heat, because heat from a woodstove typically tends to stay in one room and be slow to move to other parts of the house. Our ceiling fans help with that, but when we lose power they're of no use. That's why I've had my eye on an Ecofan. It's a bit pricey, however, so when I noticed a huge price drop for it on my Amazon wishlist, I thought, I can live with that. Most folks seem to agree that we're in for a severe winter, so it seemed prudent to finally invest in one. I clicked on the link and discovered that the nice price was for Prime members only. The rest of us would just have to pay the not-so-nice price (unless, of course, we wanted to join Amazon Prime, hint, hint). That annoyed me. 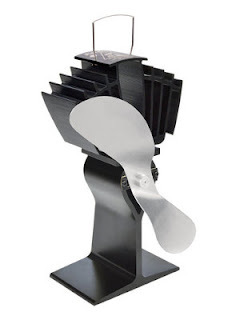 I immediately deleted the Ecofan from my wishlist and set off on a search for a better price. I found it too, at Tractor Supply. Fifteen dollars cheaper than Amazon's exclusive price and with free shipping to my home. I bought two. So what do we think and how do we like it? fan blades, but my camera wouldn't cooperate. Dan was dubious at first, but after using it for a week or so, we both agree that the house is warmer. And with smaller fires. We can position the fan to direct heat toward us, into the next room, or down the hall. That means that rooms which rarely benefit from woodstove heat are warmer than without the fan. 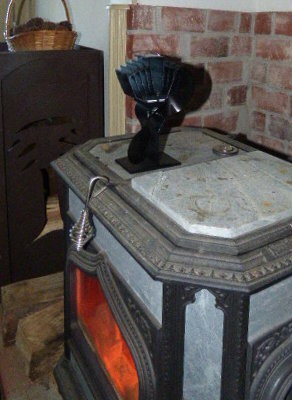 Whirling away on the back of the wood cookstove. We still do other things to help the house stay warm: close off rooms that aren't in use, keep curtains closed unless the sun is hitting the windows, and open or close specific room doors to direct heat where we want it. The only thing I wish I'd known before I bought it is that the Ecofan has a little motor which is recommended to be replaced every several years. Looking back over various web advertising, I can't find that information anywhere, but it was in the leaflet in the box. That's not a deal breaker, but it's disappointing because I'm not keen on things that need me to keep buying stuff for them. It would have been nice to know this beforehand, but that's the downside of shopping on the internet (and fodder for another soapbox). Still, I'm happy to have another useful item crossed off my preparedness list. It's well made and has some heft to it, so in spite of the one downside, I would still recommend it. For the mechanically minded, here's a link for a DIY model. A technician is coming out tomorrow to look at our modem, so hopefully, I'll be able to respond to comments and return blog visits soon. Now, Dan's eyeing the carport as his next project. I think most of us can relate to the concept of economic self-sufficiency. There is a definite appeal to the idea of having a home business or at least making money from products we create ourselves. I want to encourage you to explore avenues this year for unique handcrafted or independently produced items as gifts for family and friends. It's the best way to optimize your spreading of holiday goodwill and cheer. You'll not only bestow it on the receiver of the gift, but also on the maker of the gift. Of course, as an indie author, I include myself in that category. Still, I realize not everyone is looking for books or perhaps not my books; therefore the appeal to consider buying from indie producers in all categories. Or, leave a good review. That's a gift in itself. 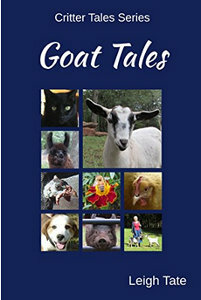 My own offerings include an eBook that has been out of print for a while - Goat Tales. 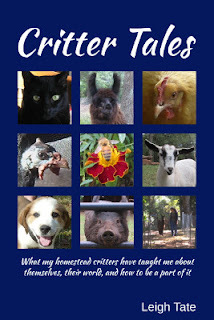 It's one set of tales from my paperback Critter Tales. Click that link to get a "Look Inside" at Amazon. If you're an Amazon Prime member, it's free! Anyone who loves goats or farm animals in general would enjoy this, I think. My other offerings include Prepper's Livestock Handbook. Best current price for the paperback is at Amazon, where it is now 30% off list price. Also, Amazon is offering a $5.00 off coupon when ordering $20.00 worth of books. But you'll have to hustle because that offer expires at 11:59 p.m. PT on Dec 1st. It's a good deal for a book lover! Prepper's Livestock Handbook is also available for Kindle and NOOK. If you are a Barnes & Noble shopper, they are offering a 10% discount coupon, details here, but it ends Dec. 2nd. 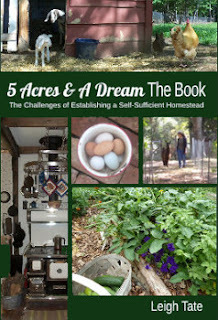 5 Acres & A Dream The Book is also nicely discounted at Amazon. Currently 40% off, it's at the best price I've seen so far. Combine that with the soon-to-expire coupon and you can stretch your gift dollars. Unfortunately, with Amazon's print-on-demand publishing department switching from CreateSpace to Kindle Direct, they are recommending price hikes. This is because KDP apparently uses a more expensive printer. I think many authors are raising prices, so now is the time to buy books (especially with the coupon I mentioned above). This might also be a good time to mention that next year Acres & A Dream The Book will become Book 1 in a series. So much has changed since I published that book that a sequel is in the works. Critter Tales, is not discounted. 😞 But I still think it's worth it, LOL. It contains tales of animal antics along with much of my research into sustainable livestock care and how we've implemented it. 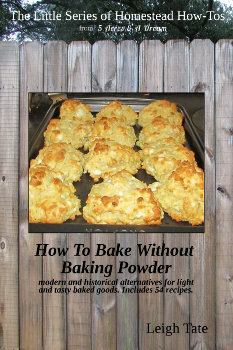 How To Bake Without Baking Powder is another of my prepper books and the only one in my How-To series that is available in paperback as well as ebook. Amazon hasn't discounted it either, but it's not unreasonably priced. I notice that shipping is free, even if you buy the one book! Combine it with that soon-to-expire discount I mentioned and you can have books for gifts as well as yourself. If you choose the Kindle edition, you can get a 75% credit toward more Kindle books. 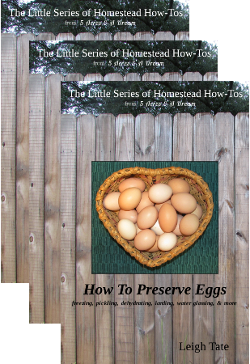 The rest of The Little Series of Homestead How-Tos are a collection of ebooks. You can see a complete listing plus where to buy, here. They are $1.99 each, but the first volume, How To Preserve Eggs is always free! Well, I had to get in a plug for my books at least once this year. I never wanted to turn my blog into one big ad, and I haven't, because as much as selling books makes me happy, I value my online community even more. I don't want to be constantly pushing things at you just so I can make money. If you do buy my books, however, a hearty Thank You! So spread some holiday cheer this year, and support your favorite authors, weavers, woodworkers, spinner, knitters, blacksmiths, potters, (etc.) with uniquely special gifts for family and friends.